...Where students gather to create, invent, and learn! Makerspaces are an open space that can fuel creativity by encouraging people of all ages to make and create. The maker movement starts to change the role of students from consumers to creators. 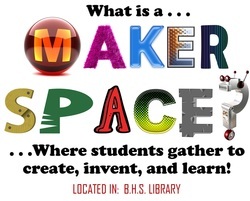 ​At BHS, we want student to Think, Make, and be Innovative. To feel comfortable in "failing forward". After all, fail stands for First Attempt In Learning. Being problem solvers and critical thinkers are important skill sets everyone needs in order to be successful members in society. Coding is what makes it possible for us to create computer software, apps and websites. Your browser, your OS, the apps on your phone, Facebook, and this website – they’re all made with code. Learning coding empowers you to do many things you wouldn’t otherwise be able to do. These things include hand-crafting your own websites, becoming a career coder or even becoming an entrepreneur and starting a technology business. Most importantly, you’ll be able to understand the technology shaping your world! Need a new cell phone case? How about a prop for a class project? Oh, I know! A gift for a friend or family member. ​By setting up your own account (see Mrs. Cichosz), you can design your own object or download an already created item to alter and make your own. From robots, to 3D pens, and circuitry to arts and crafts, there is something for every maker or want-to-be maker. Try your hand at knitting, duct tape creations, origami, cup stacking competitions, "Small Weapons of Mass Destruction", and take a break from your stress by taking the time to COLOR! We have great adult coloring books that are available to use or tear out a page to take with you.